:God goes everywhere I could ever go! And I'll tell you why ... 'cause he loves me so! Dandi Daley Mackall retells Psalm 139 using language kids can understand and memorable, fun rhymes to help children meet God in a new and profound way and grow a lifelong love of the Psalms. Beautiful, kid-friendly, four-color illustrations throughout the book help make Scripture personal and accessible for your child. 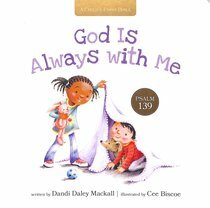 About "God is Always With Me: Psalm 139 (A Child's First Bible Series)"
Dandi Daley Mackall has published about 300 books for children and adults.She has authored the I'm Not Afraid Series and served as creative director for the TodaysGirls.com series. She also wrote the seasonal favorites, Off to Plymouth Rock, Merry Creature Christmas, and Journey Easter Journey.She's written a humorist column and served as freelance editor. She conducts writing assemblies, workshops, and Young Author programs across the U.S. Dandi writes from rural Ohio, where she lives with her husband, Joe, and three children, Jen, Katy, and Dan.- Publisher.